My Mom had a Round Tuit in her kitchen which is now my kitchen. I need to find her Round Tuit. I do need some goats - They'd take the privet out in one or two years. But I'd need a mule to protect the goats from the coyotes. I have neighbors with goats - my nextdoor has chickens and they're a big coyote and fox attraction. To connect to the PCM4222 I use SPDIF > EMU-0404 > PCI Bus. The EMU-0404 has its own console and DSP mixer. I mostly use ASIO for routing. The D/A is the EMU-0404 internal. Llama? They are good at keeping things with big sharp teeth at bay! I did nearly get one when I have about an acre around the house. I sure need a "round tuit", I have high grass waiting for me. At that place in the countryside my grand father had a couple of goats, the goat keep is still there, ready for new goats. I have a small round "tuit", on an old keychain, just a small flat chrome plated disc with TUIT printed on it. I am just happy that TUITs are now international . Well I've gotten "a round tuit" and have started the layout. Once I get started it becomes like solving a puzzle and I enjoy it. I couldn't find the "round tuit" but I did find the "got tuit." I've finished hand-routing the board. It's 4.1 x 3.1" so it grew a little bit from the moving magnet layout. I may see if I can squeeze it a little more: It just barely fits in a Hammond 1590BB. A 1590J has a little more room. I need to do component designators and then quadruple-check the routing and mechanical. 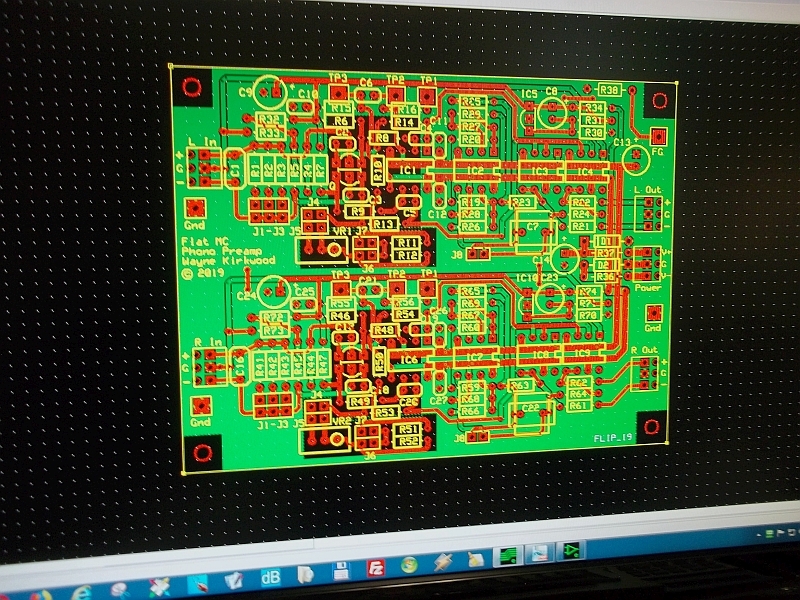 I'll probably submit the layout Monday for a pre-production run of 4 boards with a two day turn and two day shipping. Once I get "in the mood" its hard to pull away from it. Pulling away from it for a couple of days and coming back to it is always good though. Couldn't find the "round tuit" but did find the "gone-n-dunnit" also known as "git-er-done." I'm a lot closer than I was this time yesterday. I need to go back and harmonize the schematic to the actual layout because a couple of things got changed in layout WRT op amp sections, the order of some series loops and designators. Also removed some redundant test points. Once I get an updated sch I'll start re-checking routes.